The God King returns in Chair's highly anticipated sequel. Last year's critically acclaimed smash hit, Infinity Blade, put Chair Entertainment on the map. The outstanding Unreal Engine 3 powered graphics, intuitive swipe controls and wealth of items captured the collective attention of players around the world, who wound up spending 20 million collectively, a hefty sum comprised of game downloads and in-app purchases. With that kind of success, there was only one thing for Chair to do: Infinity Blade 2. Set to debut on December 1, this promising and highly ambitious sequel takes everything fans love about the first game and adds plenty of new additions in what should be one of the biggest, most impressive iPhone and iPad titles of 2011. 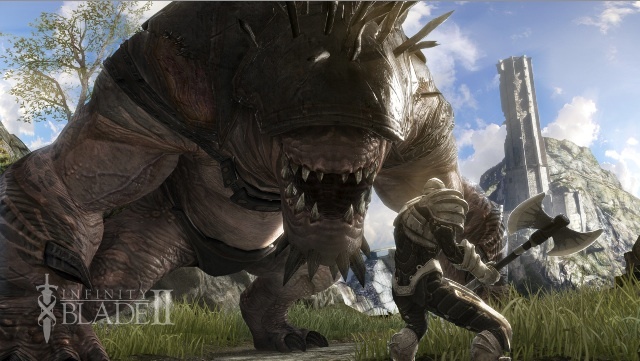 Once again, players take up sword and shield (or two swords, one of the new features) and charge through a wide assortment of creatures, where each grueling battle involves a careful balancing act of blocking, dodging, parrying and then going for the kill, executed with simple swipe mechanics that do a variety of tasks, from slashing monsters to refilling health/shield power. To that end, gamers can expect a new set of weapons and items to use, found in their travels or purchased via the in game shop; Chair also plans to support Infinity Blade 2 with downloadable content. In addition, the game has three distinct fighting styles, with unique weapons and moves to master, as well as seven classes of weapons, armor and magic items. Players will also find mystical objects that'll help them "forge new weapon capabilities", though at this point, it remains to be seen what those are. Now in the previous title, gamers explored one castle. Not so in Infinity Blade 2. Similar to the first, the sequel features branching paths, but the environments are much larger and varied. Case in point, the Asian-style estate and prison that Chair calls The Vault of Tears; these places evolve over time. 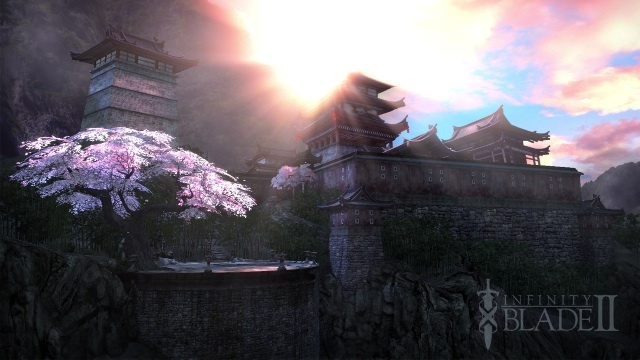 With this in mind, Infinity Blade 2 looks stunning. Chair managed to build off the first, with higher resolution textures, dynamic lighting and dynamic character shadows, plus specific enhancements for the more powerful iPhone 4S and iPad 2, both of which will showcase the game in all its visual glory. Meanwhile, players will enjoy an all-new story that lets them experience the return of the God King, who perished in the last Infinity Blade. Other features include the ability for gamers to listen to their own music, iCloud support for game saves, HDMI output and a new massively multiplayer mode known as Clash Mob, where thousands of players work together to complete group based challenges and unlock rare treasures. We're still waiting to see how it works. All told, Infinity Blade 2 appears to be a worthy sequel that'll keep iOS users enthralled for months as they destroy enemies, search for powerful swords and explore this beautiful world, at least until Infinity Blade 3 arrives.